It's also in the middle of a clinical trial conducted by Penn State. 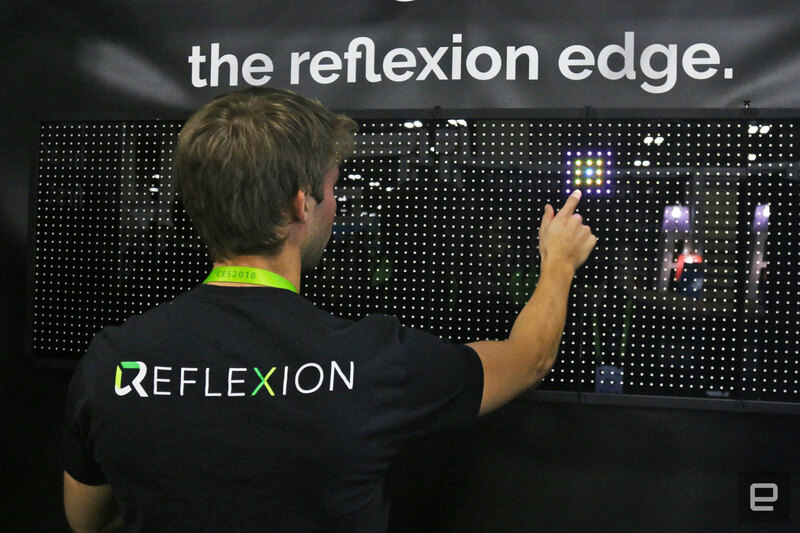 We met Reflexion and its Edge screen last year, and even then we were pretty taken with the idea: A Whac-A-Mole-style test for athletes that improves coordination and helps spot concussions after a big hit? It's uniquely odd, but valuable nonetheless. This year, the team is back with an essentially final version of its six-foot-long display, and it has one crucial trick its predecessor didn't: You can fold it up and squeeze it into a backpack, perfect for high school coaches who need to lug these things to games. The Edge has the added benefit of being a little fun: You're meant to stand in front of the big capacitive screen and touch lights that pop up as quickly and as accurately as possible. Writers aren't usually known for their prowess at sports, and a quick test confirmed that I'd be a lousy football player. As it turns out, I have great peripheral vision and I'm roughly as good at hitting targets with my left hand as I am with my right. (As a lifelong righty, I have no explanation for this.) Sadly, I'm total garbage when it comes to accuracy -- I hit spots, sure, but not dead center. These factors are folded into a profile that players are meant to occasionally update with new tests. If a player takes a bad hit, team staff can have them run through the test again; if there's a notable difference from the baseline, it's time to get that player some real assistance. While I'm impressed this beastly screen is finally portable, I'm a little more taken by the progress the Reflexion team has made since last year. Within a few months, it will deploy two Edge screens at schools in Pennsylvania. Moreover, the Edge is currently being tested in the second phase of a clinical trial conducted by Pennsylvania State University. We definitely look forward to the results.